Cloud solutions are increasingly taking over old local solutions. Technology manufacturers have clearly positioned in favour of the cloud, both because of the benefits for its customers and the advantages it provides them in the development of much more efficient solutions. The cloud is already in the hands of everyone, in personal and professional life, even unknowingly in many cases. Emails, text editors, management platforms, etc. Most tools used by companies to work every day are already in the cloud. However, there are still lots of companies with technology hosted in their own servers. Being in control of the storage platform is, for some of them, a guarantee of safety and control. The cloud is flexible, since it allows to grow at almost no additional cost. It is accessible, since it allows to be connected to the tools hosted from anywhere. And it is safe, since safety protocols established by manufacturing companies are much better than those any company can achieve independently. These are probably the tools we are more familiar with, due to their use both in professional and personal environments. ͞Boxed͟ solutions such as Microsoft Office, which became outdated every year, implied a continued investment in updated versions. Thanks to cloud solutions, such as Office 365, this problem is over. The pay-as-you-go model allows having a solution which is always updated with low initial costs. This solution allows working from anywhere and from any device as easily as from a computer. In addition, team work is much easier. Collaborating in documents and sharing files in real time provides companies with a great agility to carry out daily tasks. From an employee point of view, these tools help boost productivity. We are working with increasingly large volumes of data. Having an environment to store them safely and accessibly is a key element for the company productivity. Document storage in the cloud allows better document management and it favours accessibility without compromising the company safety. In addition, the cloud facilitates managing permits in an easier way to ensure the privacy and protection of confidential documents. These technologies allow protection of the company in the cloud. Due to the complexity involved the management of some organisations, business solutions tended to be implemented locally through big adaptations and developments, to respond to particular workflows in every company. However, the cloud provides game changes for companies. Business management platforms provide better benefits and functionality as they are becoming increasingly developed to respond to the numerous company needs. Having a business management solution in the cloud provides the company with flexibility and scalability. Cloud technology grows in accordance with company needs and never gets outdated, since updates are incorporated automatically as technology evolves. Sales teams are dynamic, little centralised and need mobility to visit their customers, manage new projects and make deals. This mobility is key in technology terms, working from anywhere and making the most of every moment in their working day efficiently is key. Cloud solutions are accessible and allow updating data from different devices, ensuring an improved traceability of information. In addition, having an integrated work environment that allows connecting the CRM, an essential solution for the SMEs, together with tools such as the email, optimises processes and boosts companies’ results. 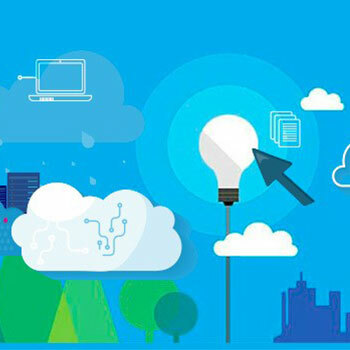 Cloud solutions are already a fact in lots of companies due to the number of opportunities they provide in terms of agility, flexibility, scalability and safety. They are key tools in the digital transformation of businesses and, therefore, in the development and growth of companies. « Are your Microsoft Dynamics authorisations GDPR-proof? » AI: The ‘Antidote’ For What’s Ailing Marketing?